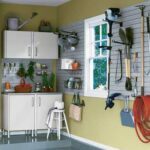 In this garage, upper and lower cabinets and a slot-wall organization system provide both hidden and quickly accessible storage. 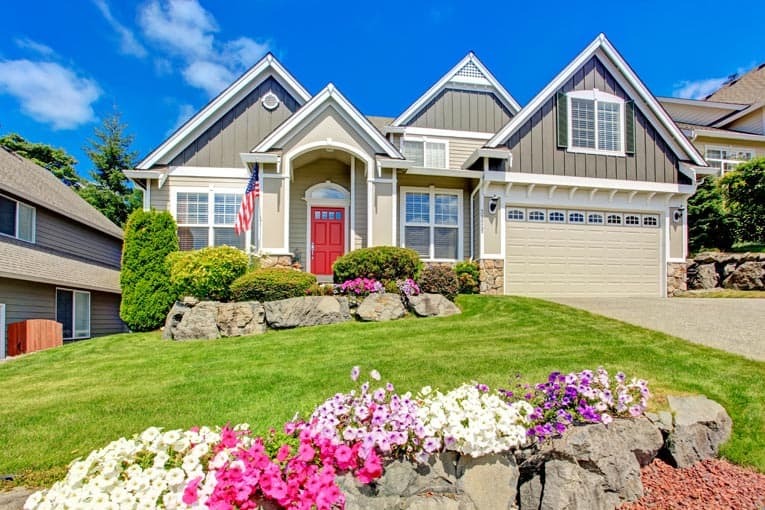 If your garage is a disorganized mess, you can get it under control with the help of several types of garage storage and organization systems. You can either build garage storage yourself, or buy storage gear through home improvement retailers and online sources such as Amazon (see bottom of page). These can help you to reduce clutter, improve organization, and store seasonal items more conveniently. The most popular types of garage storage and organization aids are cabinets, shelves, various wall-mounted racks, and plastic containers. Garage storage cabinets work well for hiding clutter and protecting their contents from moisture and dust. Garage shelves tend to be more affordable than cabinets; they efficiently save space and make paraphernalia more accessible by getting it off the floor, optimizing the amount of storage you can get per square foot of floor space. Wall-mounted storage racks, the most affordable of all, are great for keeping tools as well as equipment handy. Store items that need to be protected from moisture inside plastic storage containers. Buy the type that stack; clear plastic works well because it allows you to see what’s inside. Full-scale integrated garage storage systems look appealing, but be advised that they typically cost several thousand dollars. If you decide to opt for one of these, don’t be fooled by promotional photos that showcase neatly organized, nearly empty garages. Think about what you need to store immediately and in the future, especially if you’ve just cleaned out your garage. Adjustable shelves can add flexibility if your needs change. However, be aware that adding extra accessories like baskets and racks can quickly make a reasonably priced system very expensive. Cabinet systems are made of plywood, particleboard, plastic, or—more expensive—metal. The least expensive option is standard particleboard, but industrial particleboard is stronger and smoother. Short legs keep these cabinets up off of the garage floor. Cabinets made from plywood or particleboard are typically coated with thin melamine or high-pressure laminate. Although it’s more expensive than melamine, high-pressure laminate is thicker, tougher, and more water-resistant. Particleboard shelves with high-pressure laminate can bear three times the weight of uncoated or melamine-coated particleboard. Another advantage of high-pressure laminate is the wide variety of colors and patterns available; melamine only comes in a few colors. A good depth for lower cabinets is 24 inches, especially if you plan on putting a workbench on top of them. A 12-inch-deep upper cabinet can keep items more accessible, but consider adding just a few inches, which can increase storage space considerably. If you’re planning on storing bins or boxes behind closed doors, keep their dimensions in mind when choosing cabinets. Adjustable shelves, upper and lower cabinets, and sturdy drawers give you lots of enclosed space to keep items organized and dust-free. Water ruins particleboard, so it’s important to isolate particleboard cabinetry from moisture. Many manufacturers include hardware to mount cabinets to the wall, but be aware that mounting cabinets on the wall may decrease the amount of weight they can store. Short legs beneath cabinets are a good solution. Metal shelves on adjustable wall standards can handle heavy-duty items. When it comes to maximizing storage, shelving gives you the biggest bang for your buck. If shelves are part of your organization solution, be sure they are sturdy enough to handle the weight you intend to put on them. The shelf material makes a big difference. For average loads, a typical ¾-inch shelf made of plywood or pine will span 34 inches between supports. The same shelf made of particleboard will span 19 inches, and medium-density fiberboard will span 21 inches. For sturdier shelves, choose metal systems with adjustable vertical standards. Open shelving should be deep enough to easily accommodate bulky items. Hanging from the garage tie-joists, this top-mounted rack holds containers and a ladder. Although manufacturers sometimes suggest installing the top rail and then hanging the standards from it, a shelving system will support more weight if you attach the standards directly to wall studs. Doing so can increase the system’s weight tolerance by up to 600 pounds per standard. Overhead shelves are a great idea for storing lightweight items that would otherwise take up considerable space, such as sleeping bags. 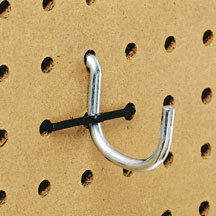 Snap-in locks can keep pegboard hooks from falling out. Pegboard is an old favorite for garage storage, and it continues to be a simple, economical, and versatile choice. A pegboard system is also easy to install, making it a great project for do-it-yourselfers. Standard pegboard is a manufactured hardboard product that comes drilled with rows and columns of holes meant to hold hooks and racks that, in turn, hold tools. Colorful metal pegboard, with custom hangers, is both strong and attractive. Basic J hooks, which have a crook in their design that allows them to hang onto pegboard, can be further secured by using peg locks. A variety of hooks—including kits—are available. Pegboard can be painted or left natural. Light colors are usually best because they contrast with dark tools, allowing you to see your gear without difficulty. 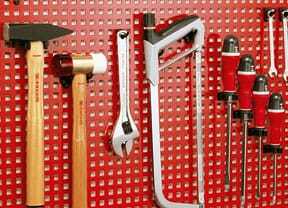 To take organization a step further, some people like to outline the shapes of tools onto the pegboard so they always know where to place each item after use. Choose 1/4-inch-thick pegboard—lesser thicknesses are more easily warped and damaged. A standard sheet is 4 by 8 feet. To install pegboard, glue 1 by 2s around the backside’s edges, and horizontally every 16 inches. Attach the panel to the wall by driving long screws through the panel and 1-by-2 strips and into wall studs. 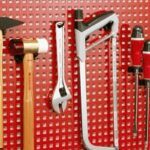 Metal pegboard, powder coated in various colors, is a more expensive and durable choice for those seeking a sturdier option for weighty tools. These come with mounting screws and utilize their own hook and hanger accessories. Heavy-duty shelf brackets lock into wire grid systems. 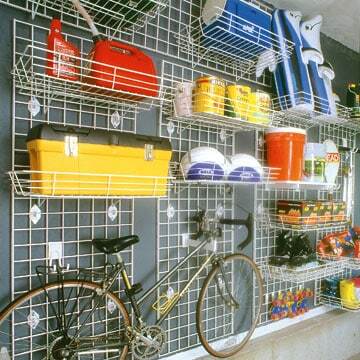 Metal wall storage grids are an attractive, sturdy way to keep your garage organized. Their durable construction can support a variety of hooks, baskets, shelves, and other accessories. For a grid that needs to hold lots of heavy items, choose one with 1/4-inch-thick rods with welded intersections. Use 5/16-inch lag bolts to attach them securely to wall studs. These heavy-duty grids can also be attached to the ceiling. Grid systems are designed to store just about anything in the garage, from sports equipment to tools and bikes. Depending on the weight of the items you intend to hang from them, you may want to attach them to rafters or joists. Lighter grids made with metal wire are ideal for organizing a wall over a workbench or the space next to a door. Wire shelves can be used with grid systems. To hold heavy items, use shelves that come with a support bracket that attaches to the grid. 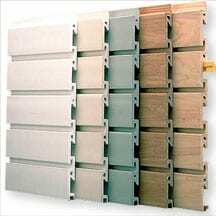 Extruded PVC slotwall system is available in colors and wood tones. 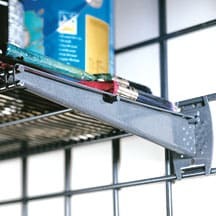 “Slotwall” storage systems have been used in store displays for years to hang racks and shelves for merchandise; now you can use them to organize your garage. Also called “slatwall” storage, a system consists of grooved wall panels that shelves, hooks, baskets, and cabinets clip onto or slide into for flexible, coordinated storage. Store-display slotwall systems are generally made from medium-density fiberboard, or MDF, while garage systems are usually PVC or CVPC (a similar type of plastic). Manufacturers of plastic systems often caution that humid climates can damage MDF systems. MDF is less expensive, but it is vulnerable to water and insects, so choose the material based on your garage’s environment. Plastic systems are easy to handle, lightweight, and available in smaller pieces than MDF systems (strips 12 or 15 inches wide by 8 or 10 feet long compared to 4-by-8-foot sheets weighing 100 pounds). Either way, you’ll need 3 inches between slots for the most versatility. MDF slotwall is great for hanging sports gear and lighter items—it holds about 35 pounds per 6-inch bracket. For cabinets and other heavier items, use plastic panels or MDF with aluminum-coated grooves, both of which are twice as strong as bare MDF.